Fire Safety Supply performs Restaurant Sprinkler Inspection in Northern California. We can perform field acceptance testing of your newly installed existing sprinkler systems and fire pumps. These tests demonstrate that all the devices and fire pump components perform according to the manufacturers’ specifications as well as proving that the water supply is adequately functioning. Fire pump performance tests can deteriorate over time or can be affected by impairments to water supplies. Regular testing can identify these problems and ensure that the sprinkler system and fire pump operate at an optimum level. 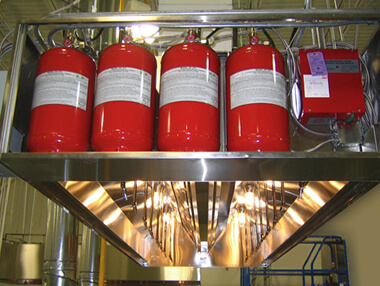 Your building relies on a network of fire protection equipment to keep your building and its occupants safe from fire. One of the most important features is the automatic sprinkler system, which acts as the first line of defense against fire, even if the building is vacant. To keep your fire sprinklers working properly, you should perform inspections and testing according to NFPA 25, which is the Standard for the Inspection, Testing, and Maintenance of Water-Based Fire Protection Systems. Retain all records of your most recent fire sprinkler inspections and tests for at least one year and be prepared to show these records to your service provider upon request. HERE’S A LOOK AT THE RECOMMENDED TIMELINES FOR PERFORMING INSPECTIONS AND TESTS AND WHAT EACH PROCESS ENTAILS. HOW OFTEN SHOULD MY FIRE SPRINKLER BE INSPECTED? Weekly or monthly: Inspect the gauges in dry, pre-action, and deluge systems as often as once a week. Wet pipe system gauges can go a month between inspections. Quarterly: Every three months, have the water flow alarm devices, valve supervisory alarm devices, supervisory signal devices, control valves, and hydraulic nameplates inspected. Annually: Once a year, inspect the hanger/seismic bracing, pipes and fittings, information signage, and spare sprinklers. Every 5 years: Conducting an internal inspection of sprinkler piping is only required once every five years. HOW OFTEN SHOULD MY FIRE SPRINKLER BE TESTED? Tests are comprised of more in-depth physical checks. Quarterly: In order to be as effective as possible, fire sprinkler mechanical devices should be tested quarterly. Semiannually: Every six months, vane and pressure switch type devices must be tested. Annually: Full testing and tagging should be performed annually. During a complete fire sprinkler system test, the technician should perform physical checks on all parts of your fire sprinkler system. These checks include water flow tests, fire pump tests, antifreeze concentration tests (in applicable systems), alarm tests, and trip tests of dry pipe, deluge, and pre-action valves. Every 5 years: Sprinklers exposed to extra-high temperatures and harsh environments, along with gauges on all sprinkler system types, should be tested or replaced every five years. Every 10 years or more: Dry sprinklers should be tested or replaced every 10 years. Fast-response sprinklers should be tested after 20 years in use and every 10 years after that. Standard response sprinklers should be tested after 50 years in use and in 10-year intervals after that. If you need a free inspection, call us at Phone: 800-498-3473 (FIRE) or email us!